In recent years, organizations across all industries have increasingly been leveraging employees for market research projects. These projects allow organizations to gain key business-related insights and ultimately drive greater workforce engagement. 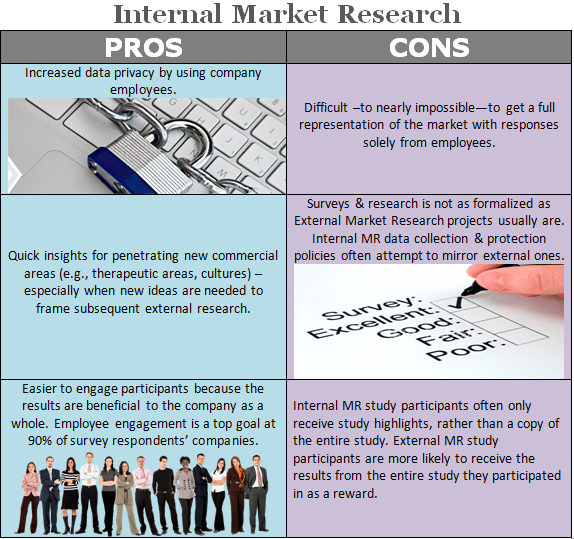 Although companies are increasingly leveraging this internal tactic, they still rely heavily on external market research (MR). A common question being asked by professionals in various industries is “Which form of MR is best?” Why would a company chose Internal over External MR? A recent benchmarking report by Best Practices, LLC offers some pros and cons for internal MR, which can help executives determine how to best achieve the insights they are seeking. While companies should continue taking advantage of each form of market research in order to better their organization as a whole, they should also become informed about which form of MR would be most beneficial for a given situation. Recognizing that external MR groups may have access to information that your company will not have access to is a key takeaway to remember. On the other hand, if quick information is needed, with data privacy guaranteed, using internal MR may be the best option depending on the given situation. Benchmarking market research in general, regardless of the Internal or External nature of the project, is a key way for professionals to gain key insights that they would otherwise have no way of knowing. It is important to continually review the value of the resources because constantly changing internal or external conditions can make them less valuable or useless at all. Apple & Amazon Have Entered Healthcare: How Will Medical Affairs Work with Large Employers?